Lilacs and cherry blossom trees are blooming. Nighttime temperatures stay above 55ºF-60ºF. Abundant rainfall creating a humid atmosphere -- you can bet the forest is growing mushrooms! Gaze into the treetops to decipher dead trees from the leafed out trees. Go to the base of dead trees in search of mushrooms. On mossy slopes below dead trees — some say Elm trees, but I think any dead wood is a place to look. 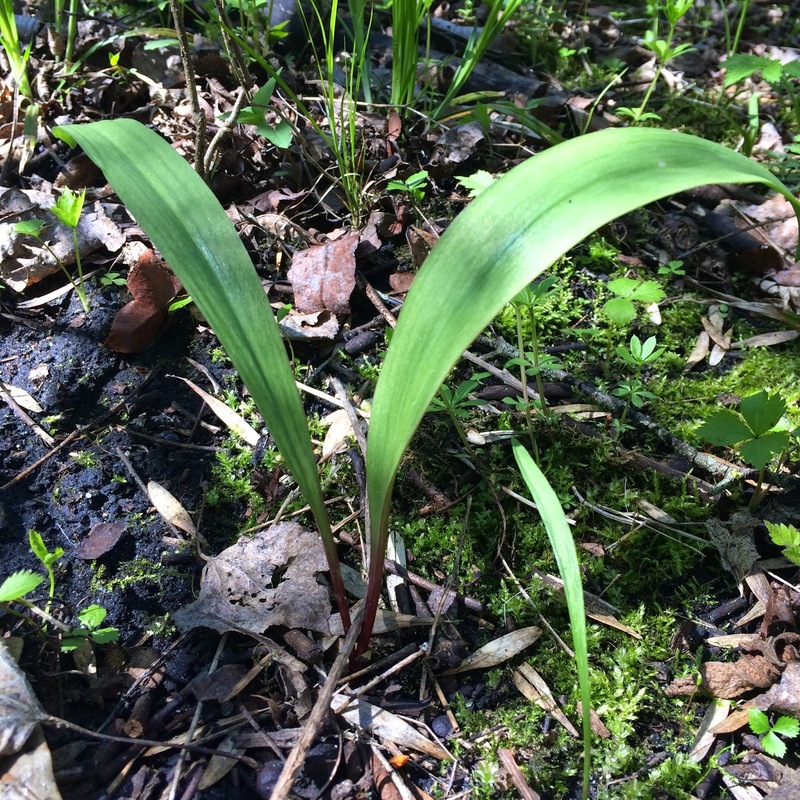 Where ramps, jack in the pulpit, & other wild flowers grow. In low lying, moist areas — You should see the ground covered in moss and 3"- 4" of grassy, patchy undergrowth. Hint #1 that morels are in season: The cherry blossoms are in bloom. Now head directly to cherry blossom tree and inhale deeply. Sweet fragrance. Hint #2 that morels are hiding in the woods: Lilacs are in full bloom. More yummy, free smells. Pro Tip #1 for morel mushroom hunting: Get the right attire to protect from wood and deer ticks. You'll want rubber boots for mucking through swamps, dark-colored clothing with all your skin covered, a hat and bug spray containing DEET or permethrin to repel wood ticks. Deer ticks want to borough into your skin and give you Lyme's Disease. Not cool. As you walk through the woods, occasionally glance down at your legs and your friend's back in search of ticks. Checking for wood ticks after being in the woods is a must, too. When you come in from the woods take your clothes off outside, shake them out, shake out your hair, check your hairline, behind your ears, head for the shower and wash off. Pro Tip #2: Ramps are going to be out in the woods, too. Pick them! Eat them. Love them. Ramps are like green onions, but with a more gentle, milder garlic flavor. Super yum. Pro Tip #3: Know false morels. See the stem? 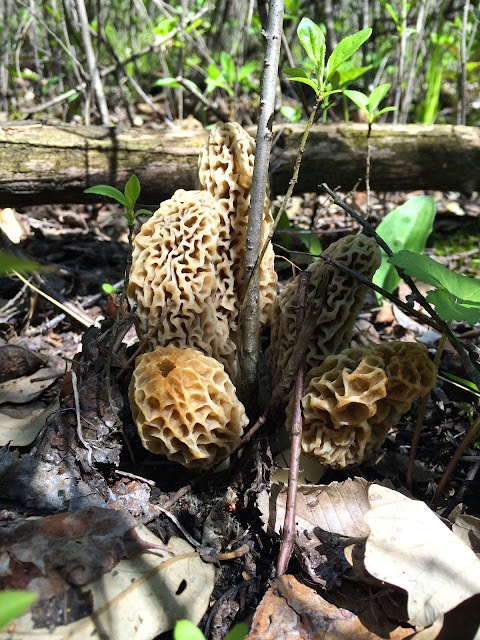 The stem on false morels is solid, morels' stems are hollow. 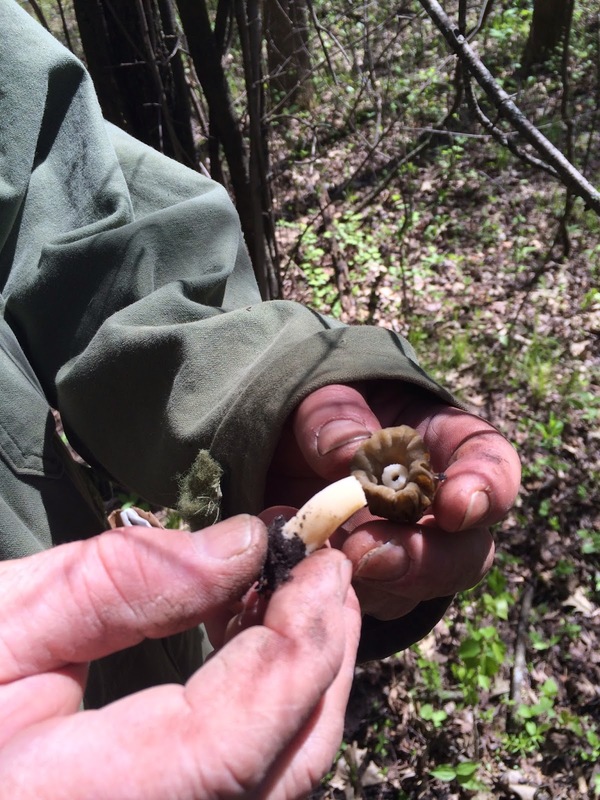 The cap and stem are different from a true morel. Bad morel. 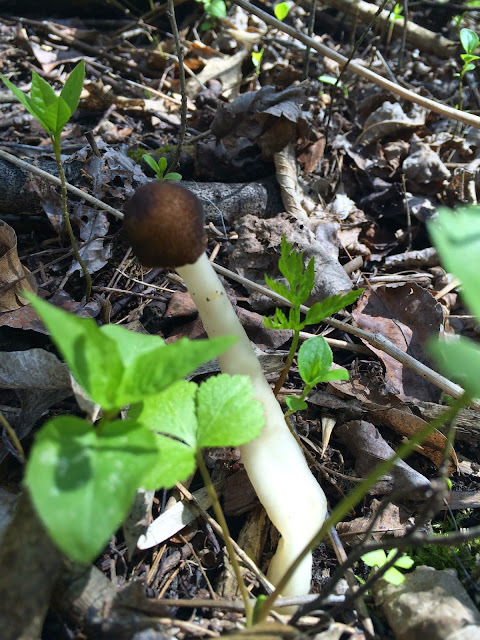 Pro Tip #4: Know the mushrooms that are inedible. This mushroom is NOT edible! The lilacs and cherry blossoms are in bloom. The temperature at night doesn't drop below 60ºF. When it has rained a lot and remained humid in the atmosphere, you can bet the forest is growing mushrooms! When you gaze into the treetops you can easily decipher the dead trees from the trees leafed out trees. Go to the base of dead trees. Walk Slow - Stop - Look Around! As you walk through the woods, walk slow, stop occasionally and slowly glance all around you. This may help you spot a hiding mushroom more easily! 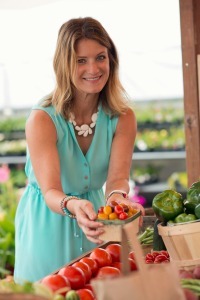 When you pick a morel, leave the roots for next year's crop! Rubber boots for mucking through swamps, dark-colored clothing with all your skin covered, a hat and bug spray to repel wood ticks are all required. Forage for other Wild Things. Ramps, Fiddlehead Ferns, Asparagus, Sorrel, Dandelion Greens, Chicken of the Woods. Know a False Morel & Other Inedible Mushrooms. False morels have a cap unlike a morel - the stem grows up into the cap and is connected differently than on a morel. Consult a guidebook to identify edible and inedible mushrooms. Check for Wood Ticks upon Returning Home. When you come in from the woods take your clothes off outside, shake them out, shake out your hair, check your hairline, behind your ears, head to the shower and wash off. Also, as you are walking through the woods on your determined hunt occasionally glance down at your pant legs in search of wood ticks. Clean Morels: Fill kitchen sink with water and dump mushrooms into sink, swish around and let sit for 10 minutes or so, allowing the critters to crawl out of the insides. Swish around a bit more, and move to a kitchen towel, further inspecting for critters. Slice mushrooms in half and give them another bath if the insides look like they just came in from the wilderness, i.e., dirty and full of bugs (you are forewarned). Prepare Morels: Heat olive oil and butter in a large (preferably) cast-iron skillet over moderate heat, until sizzling. Toss in cleaned morels and cook for about 10-15 minutes, stirring frequently. Cooking morels to a beautiful caramelization takes a lot longer than store-bought mushrooms because of the higher moisture content. Morels will release a lot of water and at one point you'll most likely have a soupy mess, continue cooking out the water until they start to caramelize, be patient. Turn up the heat if you're getting antsy. Morel Sauce: Once the morels have taken on some brown color, have shrunk to about half their size, and you've cooked down any water the morels released, season with salt and pepper and stir in garlic, sauté for a minute or two more. Deglaze with sherry and cook until reduced by half. Stir in cream and bring up to a gentle bubble. Scatter ramps over and season with additional salt and pepper. Serve with baked potato or pasta. **This post contains affiliate links so I can spend more time in the wilderness.